Coverage: Live commentary on BBC Radio 5 live, BBC Radio Ulster and the BBC Sport website and app, plus live text commentary on the BBC Sport website and app. England can use the "hatred" from their Six Nations rivals as an extra motivating factor, says head coach Eddie Jones. The Australian said he can "feel" the "long-seated rivalry" towards England as they prepare to face Ireland at Twickenham on Saturday (16:50 GMT). It is his first home match after away wins over Scotland and Italy. "Maybe Clive Woodward summed it up best when he said everyone hates England - that's true," Jones said. "I'm not going to use it, but within the side they can use it. As I said when I took over, I'm not English, I'm Australian, but I will be absolutely committed to them." 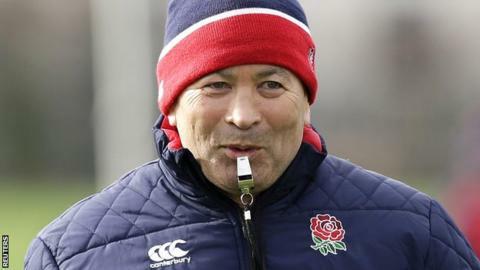 Jones also said he sees Leicester centre Manu Tuilagi's future for England in the 12 shirt, once he is fully back to match fitness as he continues his return for Tigers after long-term injury. "Inside centre is his best position," said Jones. "He's not a 13. That's what I know he's not. He's definitely a 12. He can carry the ball across the gain line. "He threw a beautiful left to right pass on Friday night. Then he threw a terrible right to left. So maybe he's left handed! "He's got all the attributes to be an outstanding 12." England are level with France at the top of the Six Nations table, ahead on points difference after two games. Jones continued to insist his side was a "work in progress" but praised his players for "commitment", "taking initiative" and "being independent". He is also preparing England for an aerial bombardment from two-time defending champions Ireland, adding: "They kick 70% of their ball away. If they want to do that, good luck to them. "It has worked for them. It is not the way I think you should play rugby, but it has been successful for them, so good luck."